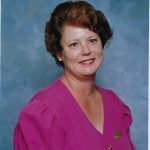 Yorktown, VA. – Kathleen (Kathy) Page Dye passed away Wednesday, February 6, 2019, at the Sentara CarePlex Hospital in Hampton, VA. Born April 29, 1950 in Waynesville, MO she was the daughter of the late Meryle Renee Scott Page and Flavel Lee Page. Kathy graduated from Burges High School, EI Paso, TX, in 1968. On October 3, 1970, she married Robert J. Dye, a U. S. Army lieutenant. Kathy and Robert’s military family lived in homes in the U. S. and abroad for over twenty years finally moving to Tabb, VA in 1984 where they retired. She was a loving stay-at-home mom of three children a member of the Dahlonega Baptist Church where she was baptized and a member of the Beta Sigma Phi sorority. She loved reading, sewing, gardening and taking care of and making memories with her family. She was an involved mom who was a soft ball coach, Girl Scout leader, little league team mom, band mom and church youth activities leader. Survivors include her husband of 48 years, Robert, her daughter: Elizabeth Dye Pell and husband Jason Pell, of Williamsburg, VA; daughter: Melissa Dye Piercy and husband Michael Piercy of Newport News, VA; son Robert Page Dye and wife Allyson Smith Dye of Poquoson, VA., five grandchildren: Chase Stinson, Taylor Pell, Emma Pell, Jake Dye, and Ava Dye. and Cousin Robert Scott and wife Brenda Scott, De Soto, MO. Brother-in-Law Paul Dye and wife Nancy Dye, Midland, GA. She was preceded in death by her parents and brother George Scott Promenschenkel. A funeral service will be held at 4:00 PM on Saturday, February 9, 2019. The family will receive friends one hour prior to the service. A graveside service will be held on Monday, February 11, 2019 in Crawfordsville Baptist Church Cemetery in Crawfordville, Ga. Local arrangements are by Amory Funeral Home, Grafton, Va.